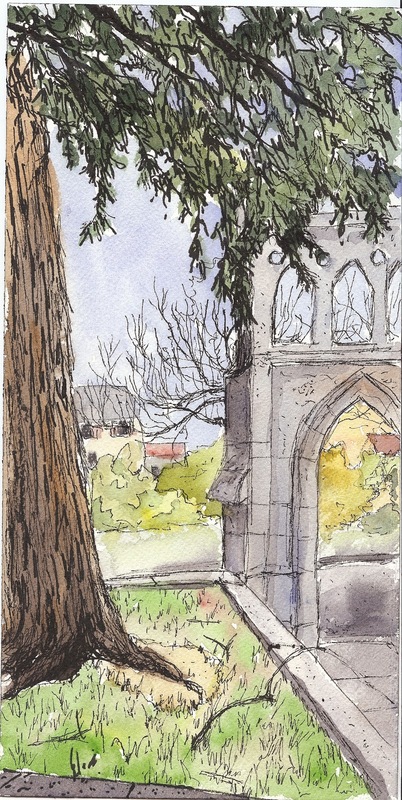 Last Thursday the SCVWS plein air painters braved record-breaking winds at the Mission and Holy Cross Church in Santa Cruz. My first painting of the mission will remain incommunicado, due to a perspective issue. 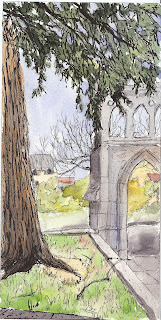 After lunch I did this pen and ink drawing from the church grounds, looking back toward the plaza. I added washes later. It's on a 6" x 14" Arches cold-press block. I used a set of black Faber Castell Pitt pens with 4 different nib sizes. Love the way the redwood foliage turned out. It could use some shadows, though. We had a good time-the docent let us go into the walled garden to have lunch, which was fortunate or all of the treats we brought to share would have been blown miles away. Janice, this is a very neat ink and watercolor piece. Great perspective on this. Sounds like another challenging day of Extreme Art! I wish I could have been there -- I believe I was heading off to NYC. Thanks for checking in on the Rosicrucian post. I need to clean that one up a bit, but I need time away from it. As always, I just love painting outdoors with other artists, especially our congenial group.